Summer of 73. Not bad, not bad at all. I dare you to compare this to any venue's summer concert schedule in the past, oh, 30 years. 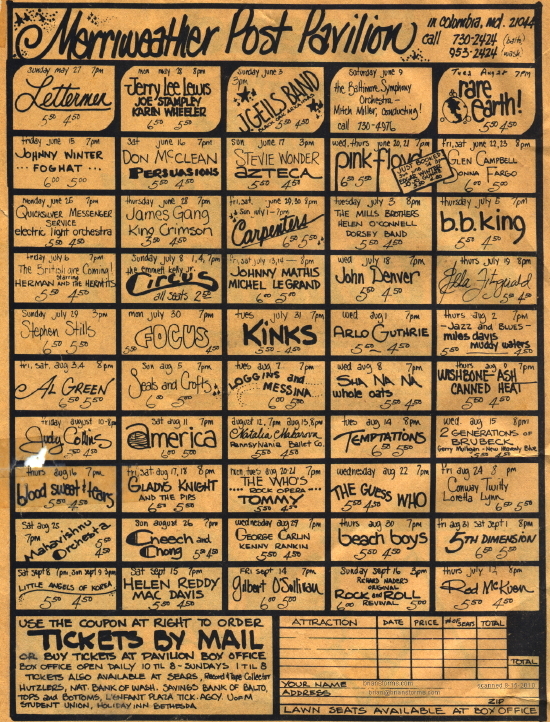 I was going through old papers and came across this ad, publication unknown, for the concert schedule for the Merriweather Post Pavilion in Columbia, Maryland, for the summer of 1973. This ought to be enough to make Bob Lefsetz wax nostalgic for the next week. Look at that lineup. What a summer. Lettermen, Jerry Lee Lewis, J Geils Band, Black Oak Arkansas, Rare Earth, Johnny Winter, Foghat, Don McClean and the Persuasions in one night, Steve Wonder, PINK FLOYD for two nights (this was their debut Dark Side of the Moon tour -- gulp! ), Glen Campbell, Quicksilver Messenger Service with guests Electric Light Orchestra (! ), James Gang and KING CRIMSON, the Carpenters, Mills Brothers, B.B. King, Herman and the Hermits, Circus, Johnny Mathis, John Denver, Ella Fitzgerald, Stephen Stills, Focus (remember "Hocus Pocus"? ), the frickin' KINKS, Arlo Guthrie, MILES DAVIS and Muddy Waters in one show (! ), Al Green, Seals and Crofts, Loggins and Messina, Sha Na Na, Wishbone Ash and Canned Heat, Judy Collins, America, the Temptations, Blood Sweat and Tears, Gladys Knight and the Pips, The WHO playing Tommy (!!! ), The Guess Who, Conway Twitty and Loretta Lynn, Mahavishnu Orchestra, Cheech and Chong, George Carlin, Beach Boys, 5th Dimension, Hellen Reddy and Mac Davis, Gilbert "Alone Again, Naturally" O'Sullivan, and Rod McKuen. Glaringly missing was Led Zeppelin but I believe they were already doing stadiums by that point. And notice the ticket prices. Man oh man, those were the days. Sad thing is, I was too young to be allowed to go to any of these. Except one. True confessions time. My family went to The Carpenters (hey, they were huge then -- note the three consecutive evenings! ), and yes, that was the first live concert I ever attended. If it were up to me I would have been at The Who, of course, but, it wasn't up to me.